Subtitles for media files can be quite useful, especially if you don't understand the language a video -- be it TV show, movie or clip -- is available in. Other uses for subtitles include displaying text in the same language to better follow what is going on or to help you follow the plot if you are not a native speaker. Depending on where you live, DVDs and Blu-Rays may come with support for additional languages and subtitles, and the same is true for online streaming services that often also offer subtitles. Sometimes however that may not be the case. If you bought a DVD in Japan for instance, chance is good that it won't offer additional languages or subtitles besides Japanese. Your best bet in this case is to search for subtitles on the Internet to have them loaded when you play the video or even integrate subtitles directly into the video file. Search an online subtitles database like Open Subtitles directly. Use an integrated subtitle search feature of the media player you are using. Use a third-party subtitle program to find and download subtitles to your system. The following list concentrates on programs that let you search for and download subtitles. While there are quite a few programs available to download subtitles to a local system, many of them have not been updated in recent time and quite a few are no longer working because of this. The main issue with all these programs is that it is difficult to find a matching subtitle as they don't reveal important information such as the length of the subtitle or the version of a show or movie it has been created for (standard or extended edition for instance). Subtle automatic / manual Open Subtitles ? PySubD is one of the easier to use programs. Drag and drop a video file into the application to have it search for subtitles on Open Subtitles automatically. While that is convenient, you will encounter situation where the program won't find subtitles even if some exist. The issue here is that you cannot adjust the search manually to find a subtitle, and the only recourse you have is to change the title of the movie or show before you run a new search. SubDownloader requires that you create an account on Open Subtitles before you can use the program to find subtitles for movies or TV shows. You can use the program to crawl a folder and all the video files it contains, or pick individual videos from the local system instead. The program lacks an option to run manual searches which leaves manual editing of the video file name as the only option to rerun searches in hope that a subtitle is found for the file. 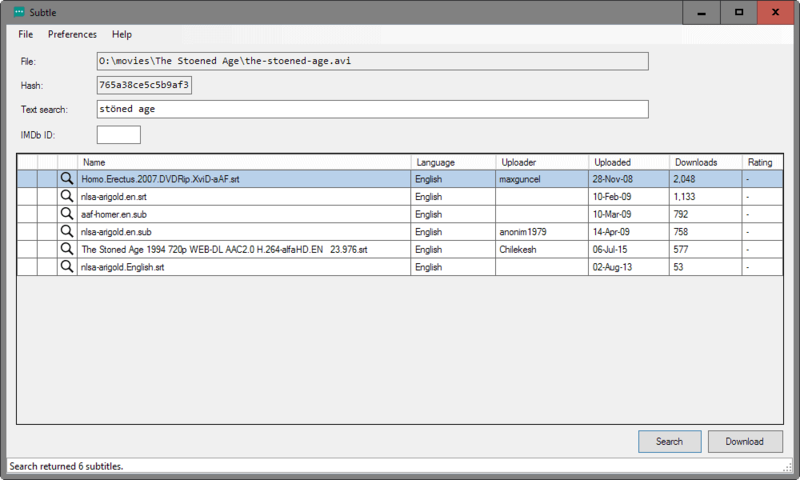 SubiT is a free subtitle downloader for Windows that supports several languages and multiple subtitle databases it pulls information and subtitles from. The interface is basic but you can search for subtitles either by dragging and dropping a video file on the interface, or by searching for a movie manually. The program displays all hits afterwards on the left, and different versions on the right. One issue here is that the interface may not be wide enough to display all information, and even if you enlarge it more, you may notice that relevant information such as the play time of a particular version of a video is missing. The program may integrate options to the right-click context menu so that you can right-click on video files to launch subtitle searches directly from Explorer. Sublight is available as a free and premium program. It enables you to search for subtitles manually or by dragging and dropping video files into the application interface. One interesting feature that it supports is bulk searching for subtitles. It supports several subtitle databases and subtitle languages, integration with installed video players, subtitle priority settings, and a lot more. Results lack relevant information such as the play length or version though which makes it a hit or miss sometimes as you may download a subtitle that is for a different version of the show or movie. It is required to create an account on first use, but that is easily done as you don't have to provide an email address or any form of verification. 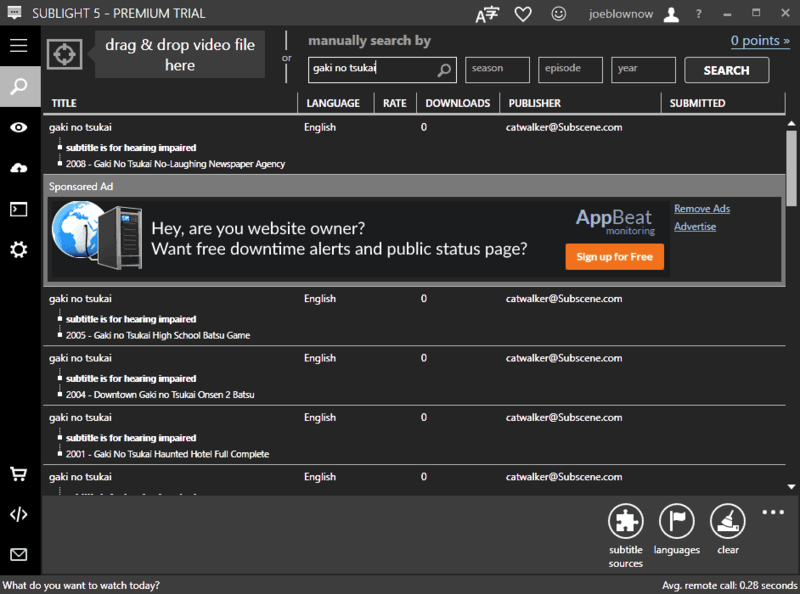 The free application displays advertisement in the interface and downloads may not be instant if you are not a premium user. Subtle is a free subtitle downloader for Windows. You point it at a video file to get started, and the app calculates the hash of the file before it runs searches. Results are displayed in an ordered list, and you may download any of the subtitles presented in that list to the local system. Subtle lets you adjust the search manually, either by changing the text directly in the text search field, or by adding an IMDb ID to the search which helps with identification. Subtitle download programs offer a convenient way of grabbing subtitles for videos on your system, especially if they support bulk operations. It may however be easier at times to visit subtitle databases directly instead to download subs from them instead of using a program for it. Now You: Do you use subtitles? The guide lists the best subtitle programs -- apps that let you search for subs and download them -- for the Microsoft Windows operating system. But… since you mentioned a DVD disk without the desired subtitle language: how to add a subtitle when playing a DVD (from the DVD-drive or the ripped ‘video ts’ folder)? If you want to play the DVD, you need to add the subtitle to it by ripping it and using DVD author software to add the subtitle (most support this). I never play files from a VIDEO_TS folder so cannot say how you would go about it. Manually search the desired language subtitle from OpenSubtites.org and download it inside the movie’s directory. Run SMPlayer to ‘open a Directory’ where a ripped DVD (with DVD Decrypter) was saved. It plays like a virtual disk, with the Movie-Menu and all. Once the movie starts, on the SMPlayer’s menu: ‘Subtitle’ > ‘Load’ and load the SRT file. And it works! No need DVD author soft. which kodi subtitle plugin are you referring to please as there are many? Great collection! I’ll test them. Personally, I use sometimes BS Player (the free version). Sublight is absolutely fantastic and you missed one of it’s best selling points if not the best. You can preview the subtitle with your local video before downloading it with a single click. If you say that it can be easier to go to the subtitle archives and find something manually then you should test and write a review of ‘Atlas Subtitler’. I use it for some time now and with about three clicks you have downloaded the best fitting subtitles. The same for whole series. I don’t think you can top that by going manually on archive pages. Curious to see your review in the future here.